I know that the theme of this blog is to write with warmth and admiration about the great Boston and New England businesses, restaurants and attractions that are no longer there, but I would like to take a moment to focus on existing old school diners. 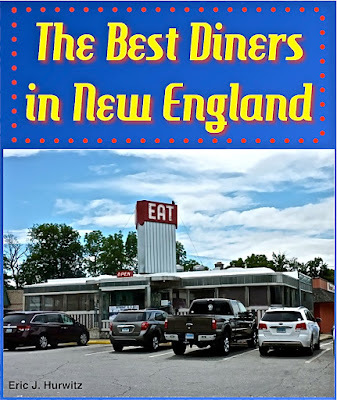 Recently, I wrote an ebook, The Best Diners in New England that reveals 50 of the top diners in Connecticut, Maine, Massachusetts, New Hampshire, Rhode Island and Vermont. The book can be read on your smartphone, laptop, tablet or computer. Hope you get to read the 200 pages covering these local, national treasures! Surprisingly, many area diners have survived the onslaught of fast food chain restaurants and bad economies. Thanks goodness! It is a true revelation sitting in these retro diners, eating some great comfort food and being served by salt-of-the-earth waitresses surrounded by all that neon and chrome. It is like going back in time -- that is, like going back to the simpler places and times that we wish never went away. Some surviving and thriving local diners I wrote about in the book: Wilson's Diner in Waltham, Kelly's Diner in Somerville, the Agawam Diner in Rowley, the Red Wing Diner in Walpole, Casey's Diner in Natick, the Delexe Town Diner in Watertown, Don's Diner in Plainville, the Owl Diner in Lowell, and the Little Depot Diner in Peabody. All these diners seems to be doing quite well, but I say, go there now as you never know. Remember the restaurants we thought would never go away but did -- like the Hilltop Steak House in Saugus, Christo's in Brockton, Benjamin's in Brockton, Benjamin's in Taunton and Finnerty's Country Squire in Wayland? Always enjoy the moment for we never know what the future brings -- especially in a diner where the authentic retro feel is often intact. I chose 50 diners to include in the book and my hope is that they all stay around forever. What a tremendous experience instantly feeling that wonderful vibe of yesteryear. Hope to see you at the diner some time soon. Editor's note: My new book, The Best Diners in New England, is now available for purchase for $11.95 through PayPal. Just click below to start the process and your book will be available instantly when the transaction is complete. 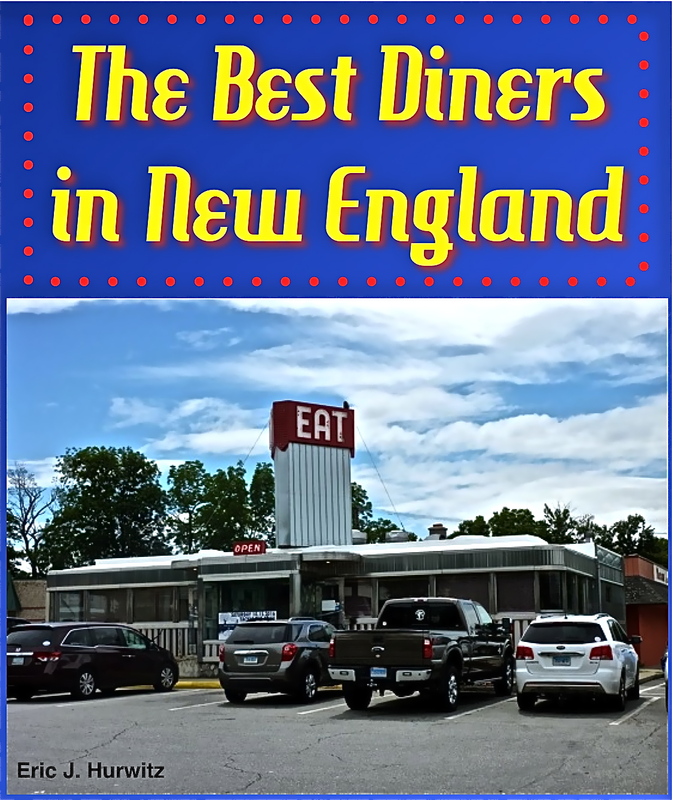 I loved the journey en route to writing this book for you, and hope that you get to eat at these 50 great diners during your New England travels! When the Mildred's Chowder House building in Hyannis, Mass., was demolished several years ago, I thought "Who were the chowder heads that did that?" No offense, but people loved Mildred's Chowder House so much that, for many, it became a big part of a Cape Cod vacation or day trip. Think about that. With all the great beaches, amazing waterfront resorts and Cape Cod summer homes to enjoy, many visitors had Mildred's Chowder House at the forefront of their minds. The power of a good, old-fashioned New England clam chowder can never be underestimated, I suppose. Nothing could take away my joy in regards to going to Mildred's Chowder House. One morning, I couldn't keep any food down, but convinced my folks that I would be OK for lunch at Mildred's. I was good to my word about lunch, although the same couldn't be said about the end of the day when eating dinner at the Neptune Room at the Hyannis Airport. Another time, I spotted this bully with a trapezoid-looking head from my hometown of Arlington at Mildred's and I didn't let his nasty presence bother me one bit. Of course, no one wanted to drive around that dreaded, traffic-crazy Route 28 rotary at Mildred's, but my dad always navigated that concrete jungle well ending with a perfect turn into the Mildred's parking lot. There were the naysayers that told us that Mildred's wasn't the same as it used to be. I bet they said that even before Mildred's started its business! The last couple of years of Mildred's in business excluded -- when the quality actually did go downhill -- this landmark Cape Cod restaurant not only was beloved by customers but the staff working there, too. Everyone seemed to work hard and in a pleasant manner, whether it be the long-time older waitresses or the younger generation working their way through college. The main dining room has a light and breezy feel, kind of like Cape Cod itself. The seafood dinners were well beyond average, but it was the chowder that excelled. I think it would be safe to say that the majority of approximately 900 customers served each night during the peak season ordered Mildred's New England clam chowder. That clam chowder was the cream of the crop -- no pun, intended, given its heavy cream base. I have read a few times that JFK liked Mildred's clam chowder quite a bit! "The Home of Cape Cod Clam Chowder" is no longer with us, having closed some time in the 1980s. Sure, other Cape Cod restaurants make chowder as good, if not better than Mildred's, but that's not the point. Sometimes, the greatness of a restaurant can only be fully measured by the feeling you get while eating there. It wasn't just about the food at Mildred's, but instead it coming down to the overall experience. Mildred's, in its heyday, delivered restaurant joy each and every time in an assuming, friendly way that came across almost like an oversized unpretentious diner. The memories remain strongly, to this very day. Howard Johnson's in Concord MA was the Best Boston Area HoJo! 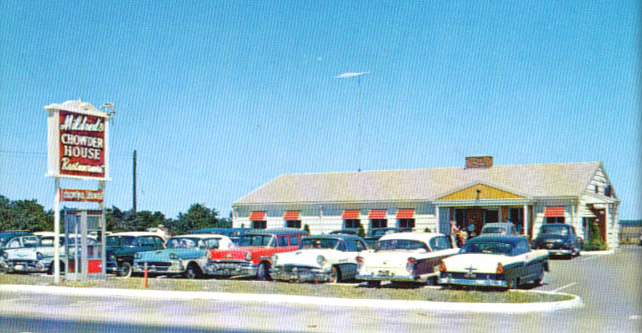 The Massachusetts Turnpike Howard Johnson's restaurants were sub-par, Wellington Circle location too congested with traffic and the Lexington one on Route 128 an accident waiting to happen with the poorly constructed entrance. Most other HoJos in the Boston area were just okay. Howard Johnson's restaurants in other states -- especially the ones in Lake Placid and Old Forge, N.Y. -- often seemed superior to the local versions with their nice designs and truer hometown feel. The Howard Johnson's in Concord, however, stood out from the others in the Boston area. Aside from the place where I often ate boysenberry jam until it came out of my ears, this HoJo consistently turned out good meals and service and featured dining areas that seemed more clean and pleasant-looking than the other Howard Johnson's restaurants experienced in the Boston area. Plus, it was in a nice part of the state with Walden Pond nearby and all those great Concord historical attractions. Today, that Howard's Johnson's is a Papa Razzi restaurant -- certainly not a bad thing, but we sure do miss the HoJo there! 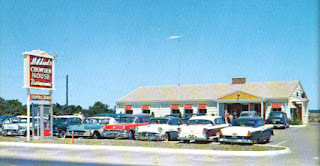 Which Howard Johnson's restaurant in the Boston area did you like best? What did you think of the Concord HoJo? 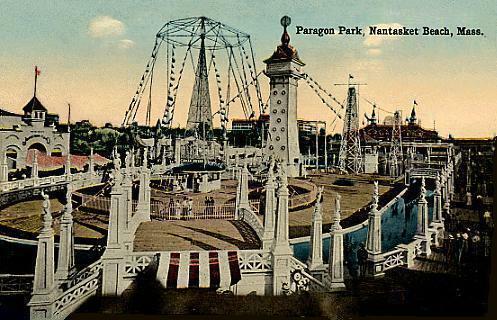 As summer comes around and thoughts turn to the beach and carefree days, the former Paragon Park would sure be welcome in a state that seems to become less fun as time goes on. Paragon Park at Nantasket Beach in Hull, Mass. had the distinct advantage of being an amusement park conveniently located, for us Boston area people, by one of the best ocean beaches in New England. For many of us, Hampton Beach, N.H., was too far away and with too much traffic getting there. Old Orchard Beach, Maine, added even more travel time and came across back then as more sketchy and the Maine ocean beach water was too cold for swimming. Paragon Park, however, was just a short high school or college group car drive away for most of us in the Boston area as Hull is considered suburban Boston. Oh, what I would do to see once again the amusement rides, arcades, the boardwalk, the relatively warm swimming water, and most importantly, the spirited summer ambiance. You didn't even have to ride the Giant Coaster or try your hand at skeeball to have fun -- sometimes, it was just nice enough walking around and feeling the essence of a fun summer through the salt sea air, the sandy ocean beaches and crashing waves, the aromas of comfort food and suntan lotion confirming the summer season, and, of course, people just having a great time on the amusement rides and at the penny arcades. After nearly 80 years bringing summer vacation joy to hundreds of thousands of people, Paragon Park closed in 1984, and Nantasket Beach just hasn't been the same since. The condo development that took the place of much of Paragon Park seems sterile when compared to Paragon Park's family-friendly summer warmth. Sure, the 1928 Carousel and mini golf remains and there is an impressive, growing restaurant scene by Nantasket Beach, but summer here seems more like a cold, winter day knowing that one of the greatest amusements parks on the planet will never be with us again. 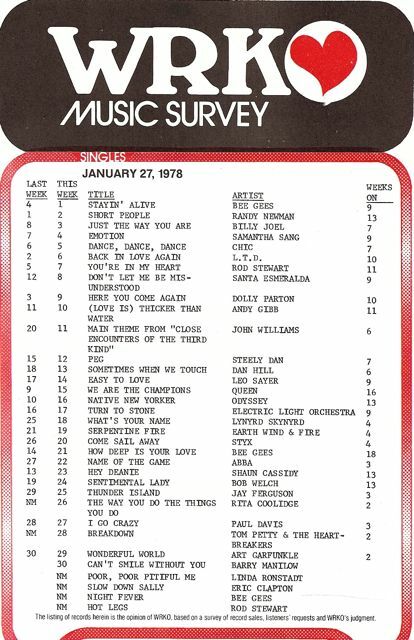 Musical Nostalgia: Where Were You When Your Favorite Song Played? Just like a best childhood friend, music memories will always be remembered. As a young kid growing into a teenager in the Boston area, I became attached to certain songs whether great or truly awful music. I felt so attached to the melodies, rhythms, harmonies, lyrics and vocals that, to this, very day, I can associate the Boston and New England places I was at when the songs played. 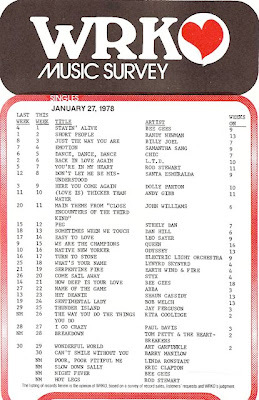 I usually heard these songs on the older versions of WRKO, WMEX and WBZ, as well as WCOP 1150 AM, WEZE 1260 AM, and WVBF 105.7 FM (now WROR). I think that part of this musical nostalgia and association simply comes from being introduced to music so early in life, and, thus, having that enthusiastic, fresh perspective outlook that could have well made some of these songs better than they really were -- but then again, maybe not. If it sounded good, they played it on the radio way back in the day. It took very little effort to love so many of these songs, as the simplicity of the music entered the mind like the way sugar consumption instantly offers happiness to the taste buds. Hmmm, maybe all those Skybars and Zarex fruit drinks played a role, too! More importantly, these songs spurred emotions and personal memories. The connection to this music never went away. Since modern day radio in the Boston area plays virtually nothing from the past, I created a list on Spotify entitled "Soundtrack to Childhood." It's an amazing feeling hearing 16 hours of music from childhood and often I will experience goosebumps, a warm memory, and not afraid to say, a tear or two (for some reason "Day After Day' by Badfinger strikes an emotional response, perhaps having something to do with the melody). In my mind, I do think back to those places and times when the songs played and the connections becomes even stronger. The power of music is clearly undeniable! "Nashville Cats" by the Lovin' Spoonful -- Silver Lake State Park in Hollis, N.H.
"In the Summertime" by Mungo Jerry -- our backyard in Arlington, Mass., during a summer barbecue. "Don't Pull Your Love" by Hamilton Joe Frank and Reynolds -- Driving past Manchester, N.H., on the way to the White Mountains with our grandma and grandpa from Michigan Ave., in Lynn, Mass. My grandpa wasn't feeling well and it worried me. "Can't Get it Out of My Head" by the Electric Light Orchestra -- Taking a mystery ride on Routes 9 and 20 to West Springfield after my dad bought a Mercury Marquis station wagon with the phony wood paneling. The new car smell created equally strong memories. "To Sir with Love" by Lulu -- Dale Pharmacy, Burlington, Mass. "Peace of Mind" by Boston -- Heading to the Acropolis Greek restaurant in Cambridge. "Mandy" by Barry Manilow -- Driving to Bates Farm ice cream stand in Carlisle (which is now Kimball Farm). "She'd Rather be With Me" by The Turtles and "You're Just Too Good to be True" by Frankie Valli -- Almy's department store in Burlington, Mass. "Let's Pretend" by The Raspberries -- Arlington Pet Shop in Arlington, Mass., in the heights. "Superstition" by Stevie Wonder -- Tropic Isle Aquarium, Framingham, Mass. "Black Betty" by Ram Jam -- Hall's Nostalgia baseball card shop, Arlington. "Key Largo" by Bertie Higgins -- Marshalls clothing store in Bedford, Mass. "Joanne" by Michael Nesmith -- Hyannis, Cape Cod day trip. "Mr. Bojangles" by The Nitty Gritty Dirt Band" -- downtown Lexington, Mass. "Take Me Home, Country Road" by John Denver -- Parmenter Elementary School music class, Arlington, Mass. "Flirtin' with Disaster" by Molly Hatchet -- riding with a friend in his blue Ford Mustang in Winchester, Mass., heading toward a baseball card shop in Stoneham. Just wondering, do you also associate an old song with a certain place or time? If you loved no frills Boston seafood restaurants, few were better than Dini's Sea Grill on Tremont St. So many state politicians ate there that their offices must have been empty at lunch time -- although that wasn't always the case. The Boston Globe once reported that former Massachusetts governor Edward King once "had $1,200 worth of lobster and crabmeat salad sandwiches delivered from Dini's to his office." (reference: https://www.highbeam.com/doc/1P2-8187359.html). Dini's not only had a memorable, non-generic short and snappy name, but a real reputation for serving well above average seafood without a need to rip off the public with phony, inflated prices. Yes, Dini's might have only gotten one star from the Mobil Travel Guide, but the locals knew better. After all, so many of us Bostonians knew, and still know our seafood. Opening in 1926 and closing in 1990, Dini's built a strong reputation on serving excellent schrod and variations of lobster dishes like Lobster Newburg. Although it didn't come from the sea, Dini's tartar sauce (yes, the rare tartar fish species...) always seemed to received high accolades. A lot of really old people seemed to love Dini's. Maybe they wouldn't look so old now, though. If Dini's were around today, I'd be going there all the time. It's really hard to find a straightforward fish restaurant nowadays, eh? Does anyone remember Dana Hersey and The Movie Loft on WSBK, Channel 38 in Boston? Hersey, with his deep, resonant theatrical voice, expertly hosted The Movie Loft in the late 70s and 80s, making it a Boston area household name-caliber locally broadcast TV show. Dana's encyclopedic knowledge of movies made the intros make one want to watch the films. He looked and sounded like a movie star himself and it made you wonder if he could have gone national like fellow Boston media star Tom Bergeron. The Movie Loft actually helped pioneer a new type of television broadcasting by introducing the hosted movie format to the Boston area, as well as airing only "unedited" movies. That was quite an eye and ear opener for someone who was watching shows like Gilligan's Island, Leave it to Beaver and Gomer Pyle. As far as Channel 38, it is still a great station (they still carry The Three Stooges reruns! ), but I miss the days when Storer Broadcasting owned it. Watching The Movie Loft, The Three Stooges, Looney Tunes, The Andy Griffith Show, and, of course, the big, bad Boston Bruins made for some warm TV memories. Yes, TV 38 -- along with playing outside until it got dark -- might have delayed us from getting our homework done earlier than later, but we did all right in the long run. Anyway, you sure have come a long way from your announcing days at WLYN-AM in Lynn, Dana! He actually never retired from local media and can still be heard mornings, locally, on North Shore 104.9 FM! Let's face it, Sunday nights as a teenager in the Boston area weren't the best of times in the 1970s. An increasing homework load had to be completed for Monday morning, the "Wonderful World of Disney" movies on NBC had become lame seemingly overnight, and the chance to sleep until 10 a.m. -- like on Saturdays and Sunday mornings -- was not possible again for several more days. Thank goodness for the Sports Huddle, broadcasting every Sunday night from 7-11 p.m. -- most prominently remembered on then WEEI 590 and WHDH 850 AM in Boston. From the "big top" circus music leading into Eddie Andelman, Jim McCarthy and Mark Witkin announcing phony sports news with bad puns and jokes to the sign off with Gene Autry singing "Happy Trails," and Donald Duck giving the station identification, the Sports Huddle provided the most fun, entertaining radio show in that glorious era of Boston radio. They made Sunday nights a lot better for us brothers, as well as mom and dad, too -- that's for sure. We would all sit around laughing at what Eddie and crew would come up with on a given night. No matter how limited the Zenith, Hitachi and Magnavox transistor radio were in consistently bringing in the signal, the Sports Huddle always came through the small speakers loud, clear and always with an incredible spirit and love for sports -- well, maybe, except for hockey from Eddie's perspective. More on that later. Eddie, Mark and Jim weren't supposed to be talk show hosts. In a generation with big, booming top 40 voices, conversational middle of the road (MOR) radio personalities, and serious analytical talk show hosts, Eddie, Mark and Jim came from different backgrounds as a real estate broker, insurance salesman and lawyer, respectively. They bridged professional broadcasters and amateurs masterfully without virtually a minute of downtime. The amateur part made perfect sense: a WUNR 1600 AM executive reportedly discovered the trio talking sports in a Boston bar. Next thing they knew, a show was born on WUNR with an ensuing short stint on 50,000 watt powerhouse WBZ AM -- which Eddie later frequently referred to as the "Wyoming Blasting and Zoning Company." Eddie, as you could see in that last quip, was the wisecracking, humorous leader with a Catskill sense of humor and a thick Boston accent. Jim sounded like the opinionated Boston guy you would meet at a summer cookout. Mark came across as the true gentleman of the group and one with a thoughtful, balanced approached although he was fully capable of subtly throwing in a few zingers. Although one could say that the free-form Sports Huddle format was a precursor to today's loud, opinionated, "anything goes" sports shows of today, the reality is Eddie, Mark and Jim's show differed greatly. The key in the Sports Huddle success was to have fun and be original and creative in a G to PG-rated way, while many of today's "shock jock" sports shows rely more on mean-spirited cheap shots, too much emphasis on talking about about things other than sports, and an overall self-importance that, at times, is not very likable. With that said -- and for the record -- I do enjoy the modern day sports talk shows for different reasons, but just not as much as the Sports Huddle back in the day. Eddie, Mark and Jim were quite likable and full of memorable moments that I remember fondly, to this very day. Not only did Eddie, Mark and Jim make the show special, but also superbly talented newscasters like Joe Klemente (hope the spelling is correct) and Vin Maloney added funny spoofs, as well as the callers contributing everything from incredible depth to priceless shallowness. Eddie seemed to love the Kowloon Chinese Restaurant in Saugus, Mass., and made frequent references to the gracious Wong family (the owners) pu-pu platters and all the other great food there. Eddie just talking about the Kowloon made my mouth water -- he really brought life to that place by enthusiastically talking about the food. Eddie wasn't so kind, however, when describing the former Joe and Nemo's restaurant. For some reason, Eddie seemed to insult the game of hockey frequently. He used names like Pierre LaPoop as a default hockey name. I suspect he was behind the Doka-Cola commercials with Witkin mimicking Boston Bruins defenseman Gary Doak (you know, the guy who blocked hockey pucks with his face) for the phony ad. There was this running gag with callers always asking, "Hey, what did you think of the Vadnais trade?" Let me explain, or refresh you on that one: Carol Vadnais and Phil Esposito were traded in 1975 to the New York Rangers for Brad Park, Jean Ratelle and Joe Zanussi! Speaking of Esposito, Eddie continuously played a sound bite of him stammering repeatedly saying, "I don't know" and ending by saying "It's really stupid." Eddie would start by saying "We asked Phil Esposito what he thought and here's what he had to say..." Eddie also had sound bites of former boxer Leon Spinks and and Korean religious leader Sun Myung Moon that came in handy when pressing questions need to be answered. On one show, Eddie asked callers how they would improve hockey if in charge. One caller suggested putting a huge pit in the middle of the ice. Another thought having a "jump puck" (like a jump ball in basketball) would liven things up. Someone else said that turning the nets around to face the boards would create a better challenge and more entertainment. I called in and said that the game would be better if fans moved the hockey players around with levers just like in the toy hockey games. In addition to the hockey schtick (no pun intended), here were some of my favorite moments...Eddie, Mark and Jim called a San Diego hotel in hopes of getting in touch with someone at the Major League winter baseball meetings. With the request once again rejected on the final call, Eddie heard someone in the background stating that someone was having a problem in one of the rooms -- to the best I recall, it was a lack of hot water running. Eddie heard the room number given, hung up and called back the hotel asking for that room number. The lady in the room answered the phone and Eddie took on the role of the hotel manager. You probably get the rest of the picture, but the lady seemed to assume the role of an outraged Margaret Dumont (a Marx Brothers foil) and Eddie as Groucho Marx for more than a few minutes. When she demanded to talk with Eddie's " hotel manager," he refused, and a verbal war broke out to the point of hilarity.Eddie didn't like former Red Sox manager Don Zimmer -- at least that's the way it came across on the radio. Whenever anyone mentioned his name on the show, Eddie would play this sound bite: "I'm sorry, You are not to refer to the Red Sox manager by name. His code name is: 'Chiang Kai-shek'." The callers. Violet, a lovely-sounding older lady, would call in regularly and talk genuinely, sweetly and with common sense about the sports issues at hand. Eddie, Mark and Jim really seemed to enjoy her calls and treated her so well -- like a beloved aunt. Tony from Everett would phone in with his easily identifiable "hot ticket" personality. His calls were definitely "quality," but I think his determination and commitment to be a regular caller was more prominent. "Paul the Poet" would call in this these incoherent, marble-mouthed poems. I, for one, thought they were brilliant and preferred the readings over Emily Dickinson. Eddie Costello phoned in with normal-sounding banter, at first, but then transitioned into a one-man musical band with his voice (drums were the dominant instrument, it seemed), toward the end of the phone calls.How about the time they called the commander of the Buckingham Palace Guards hoping for a "changing of the guards" -- that is, the English Queen trading her best for a pair of New England Patriots guards? Sure, the Sports Huddle provided great, one-of-a-kind entertainment for many years, but it would all be to no avail if the trio didn't know their subject matter. I learned so much about sports from them. If not for their encyclopedic sports knowledge, the show would have worn out its welcome sooner. Funny is good and depth is the catalyst to keep the entertainment rolling. The Sports Huddle brilliantly connected the two and, ultimately, hit a home run for us on virtually every show. What a great show -- often imitated, but never duplicated! Somebody could write a book about the Pillar House in Newton, Mass., but I'll just give you the Cliff Notes version here. I think many Route 128 commuters wondered, "How the heck could this historic, grand restaurant be virtually within a stone's throw of one of the busiest highways in Massachusetts?" Here was this large Greek Revival home coexisting with area hotels, high tech and industrial buildings and people driving bored and miserable, wondering if cell phones would ever come along to take them away from their own thoughts and imagination. Thank goodness, this gracious 1828 home gave commuters something special to look at unless you also counted the "Charlies Angels" billboards. Better yet, this wasn't just another stately Newton home but also a darn good restaurant. Opening in 1952 and sadly closing in 2001, what happened in between at the Pillar House was remarkable. Sure, we can start with the Pillar House's incredible prime rib dinner and relaxed but elegant old school dining rooms, but this landmark restaurant also pioneered some landmark decisions. Owner Thomas Larson -- who took over from his father George running the Pillar House until 1964 -- made the brave and unorthodox decision to close the restaurant on weekends in 1973. He respected his employees' lives outside of work, and thought giving them this time off would allow for a happy, top-notch staff. From what I saw, he made the right call -- the staff was superb. The naysayers thought he was nuts, but what did they know. They were naysayers! Then in 1973, Larson made another bold decision to make the Pillar House the first 100 percent smoke-free restaurant in Massachusetts. Sure, they lost some customers but in retrospect, the smoke-free decision served as a precursor of what was to come regarding restaurants in our state. As if that wasn't enough, Larson went against all trends once again by banning cell phone use in all dining rooms in 1999. Good for him -- this helped foster customers with better manners, the way it used to be. The Pillar House had a tremendous run until 2001, and then several years later was reassembled and restored to become part of a private residence in Lincoln, Mass. They really don't make restaurants like the Pillar House anymore. So many traditional high end restaurants have gone that way. In a sleek, often pretentious world of dining where trends and contrived ambiance have too often taken over authenticity and a slower pace, I plan to hold onto the memories of places like the Pillar House as long as possible. I know many of you feel that way, too. I don't know what I liked better, the family-style chicken dishes at Fontaine's in West Roxbury or the neon waving chicken on the sign out front. If it came down to one or the other, I'd probably go with the sign. Fontaine's certainly served up some excellent chicken, but how many restaurants had that kind of sign? Every time I drove by that crazy-looking chicken, it brought a smile. I might have driven that way a few more times than necessary just to see that sign. Again, nothing against the restaurant inside -- what a happy place with all those long-time, old school Boston waitresses taking care of customers in a retro carpeted dining room like they were family. It's just that I really liked that chicken sign! What a shame Fontaine's closed down after more than 50 years in business and just as sad that the spastic waving chicken no longer graces our drives down Route 1 towards Boston. I cry "fowl" that they went out of business! Anyone remember Clark Smidt and Captain Ken Shelton working all those hours to make WBZ-FM (106.7) one of the great Boston rock stations in the early to mid 70s? Other stations had fast talking DJs and catchy jingles, but Smidt and Shelton chose to wisely slow down and connect with the listener in a conversational way while always possessing encyclopedia-like knowledge of rock and roll. It was almost like they were broadcasting from a living room, or talking with you like best friends over a pizza and soft drinks (well, my perspective, anyway, as a then under-18 radio listener). I loved the "The Boston Top-30" nightly, in particular! Clark and Captain Ken eventually migrated from WBZ-FM to WCOZ 94.5 -- a very good rock station, indeed. I just preferred WBZ-FM as the format offered lots of commercial free music and Clark and Capt Ken showing their strong work ethic by seemingly running pretty much the whole show. Hard to believe WBZ FM is now a sports station on 98.5, and 106.7 became a new radio legend, of sorts: Magic 106.7. The Commodore in Beverly, Mass., seemed like a restaurant that would stay open forever. Legendary Boston Red Sox broadcaster Ken Coleman had those great ads for the restaurant during Red Sox games in the 1960s and 70s. The Northeast Mobil Travel Guide -- a generic guide that seemed to give great restaurants one star -- opened its heart and gave The Commodore three stars every year. The restaurant has this great wishing well with a water wheel near the entrance. Oh, yes -- almost forgot -- they got the steak, chicken and seafood thing down to perfection each and every time. Although I went to the Commodore mostly as a kid, that cozy Captain's Lounge sure looked cool, too! It would have been so amazing to have a glass of Zarex there! The spacious dining room -- shaped like a boat but looking nothing like one -- accommodated everyone comfortably and the waitstaff brought this old school vibe with their old-fashioned outfits and collective conversational style. They served lobster, prime rib and other tried-and-true classics as if you were family. Don't quote me on this, but I think the Commodore closed in the late 1990s. What replaced it? Surprise, surprise, surprise -- a shopping plaza. You can find those anywhere, but The Commodore -- well, that was one of a kind. Sorry that this nautical-theme restaurant sunk into Old School Boston restaurant oblivion. Who remembers The Commodore and what are your memories of the North Shore restaurant? Anyone Remember the Wallex Recreation Complex in Waltham, Mass.? Sometimes the genius of humanity resides in its simplicity and the former Wallex Recreation Complex in Waltham, Mass., certainly tapped into that condition. Starting in the 1940s as a 20-lane candlepin bowling alley, the complex became a huge Boston area travel attraction when the bowling alley expanded in the 1950s and 60s, a roller skating rink opened, and much later on, the addition of a really good mini golf course, as well as kiddie rides and a ice cream and snack bar. I always thought, "The people who thought this up and made it happen should win some kind of humanity award." Wallex was just so much fun! The legendary "Candlespins for Cash" TV show filmed segments here and word has it that many celebrities frequented the place when in Boston. I never saw any celebrities, just a certain group of self-perceived popular kids from Arlington High School who regarded themselves as celebrities (in their own minds) -- that is, until they graduated and the story changed for them. 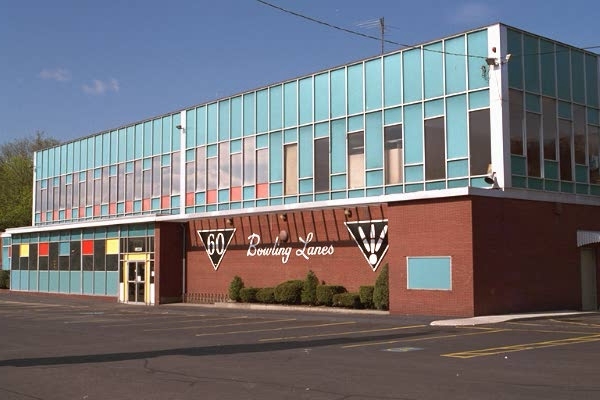 I remember my folks dropping us and the Flaherty kids at Wallex, and just having a great time with lots of laughs and many bad bowling and mini golf scores. I know it has happened to others, but it was always hysterical to see someone accidently aim the bowling ball badly into the adjacent lane, or start out in good form but have the bowling ball end up at the scoring table rather than the pins. Like what they did to Paragon and Whalom Parks, big business came in and took away all the fun. Gone were the days when I broke 70 in candlepin bowling, accidently hit mini golf balls onto the busy main road, and becoming twisted by the sugar overload from too many soft serve twist ice cream cones. In all fairness, the Wallex Recreation Complex did begin to show its age with some wear and tear, especially at the bowling alley. Everything came to an end in 2002, and now the site houses a CVS and Staples. The great memories, however, can never be taken away.